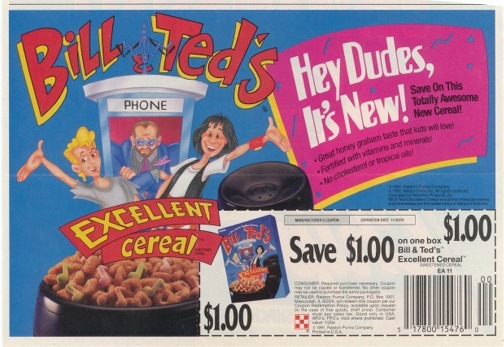 Bill & Ted was the franchise that kept on giving; it spawned not only a theatrical sequel but a pretty good computer game, a mediocre NES game, a short-lived live action series, and a cartoon which then spun off its own cereal. It’s Lucky Charms, but with musical notes as the marshmallows. And cinnamon. That sounds pretty great, right? Well, if you believe Wikipedia (WHO WOULDN’T), the box and potentially the cereal itself were stolen from an art student’s final project in 1990. Is that true, or was some college kid looking to cash in on a hundred-dollar idea? Who knows! Here’s Arsenio Hall and Alex Winter discussing the cereal in 1991 on The Arsenio Hall Show. 1:45 in.